The city of Hoboken, New Jersey, is a great place to be if you fancy the arts. After all, with the Hudson Shakespeare Company that performs free outdoor productions in the summers, anyone in any financial situation has the ability to partake in a great show! Hoboken is also a great place to live and raise a family. You can take the kids out for a day in Frank Sinatra park, named for Ol’ Blue Eyes, one of Hoboken’s most revered kin. Or you can simply enjoy a nice day at home in one of Hoboken’s beautiful pieces of real estate. Of course, your home will only be as beautiful as you make it. And a great way to make your home every bit that beautiful, consider getting top-quality marble tile installed within it. Should you be in the market for excellent tile at a great price, you can rely on Hoboken’s tile experts at Kennedy Tile & Marble Inc. to supply you with top-quality material cut for whatever needs you have! Marble Tile In Hoboken, Nj. Sturdy, beautiful, and long-lasting, marble tile is a top choice among homeowners and business owners who are looking to adorn their property with absolutely breathtaking tile. Of course, aesthetics and durability are not ALL that marble has to offer your home or business. Indeed, with its water-resistant design, marble will prove to be great not only for your sensibilities but also for your home’s well-being, as marble tile can protect your home from the mold development and wood rot that could develop because of water leaks and such. If you are in the market for top-quality marble that’s cut precisely based on your needs (whether that need be for tile, countertops, or so forth), then don’t hesitate to call on the tile and marble experts at Kennedy Tile & Marble Inc. today! Custom Stone Fabrication In Hoboken, Nj. 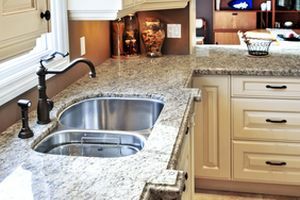 Natural stone proves to be a great material for many purposes in your home or business: flooring, tile walls, countertops, backsplashes, you name it. Of course, stone doesn’t naturally grow and develop in a way that’s particularly useful for ANY of those purposes. No, indeed, stone grows in random and non-specific patterns that make better yard decorations than tile. To MAKE stone useful for your in-home purposes, you need to have that stone fabricated — or cut — by an experienced pro. And for Hoboken residents, that expert is none other than Kennedy Tile & Marble Inc. We can cut your preferred stone to your exact specifications to help make your home look as beautiful as you could possibly want it to!